Tik-Tok of Oz is the eighth Land of Oz book written by L. Frank Baum. Published in 1914, the book actually has little to do with Tik-Tok and is primarily the quest of the Shaggy Man (introduced in The Road to Oz) to rescue his brother, and his resulting conflict with the Nome King. Source: Baum, L. F. (1914). Tik-Tok of Oz. Chicago: Reilly and Britton. A message to the readers about the history of the story. Queen Ann was the ruler of Oogaboo, the smallest and poorest in the land of Oz (except for the peaceful Emerald City ruled by the young Ozma). Ann decides to build an army and overtake Ozma’s throne. Ann and the unlikely army prepare and march to the Emerald City. Upon seeing (in her magic book) Ann’s plan to attack the Emerald City, Glinda casts a spell sending Ann and the Oogaboo army to a different village. They decide to conquer this deserted place and come upon a Rak instead. 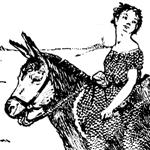 Betsy Bobbin and her friend Hank, a donkey, are shipwrecked and floating on a raft in the ocean when they spot a beautiful country that looked deserted. Betsy and Hank wander around the country and meet the enchanted Roses who explain that intruders are not welcome in the Rose Kingdom. Betsy, Hank and the Roses meet the Shaggy Man. The Royal Gardner explains that all intruders are to be put to death, and when Betsy wants to run away, Shaggy telles her about his lost brother, the Love Magnet, the Nome King and the Land of Oz. The three friends pick a rose princess (Ozga). Betsy, Hank, Shaggy and Princess Ozga meet Polychrome (a fairy daughter of the rainbow). She tells the group that she will help them find Ruggedo’s (the Nome Prince’s) underground caverns. They come upon Tik-Tok. Betsy and her friends meet Queen Ann and her army. Queen Ann tries to conquer Betsy and her friends, but once the Shaggy Man removed the Love Magnet from his pocket, all talk of conquering was forgotten. Ann decides to conquer Ruggedo instead and makes Tik-Tok her new private. The adventurers cross the Rubber Country and continue on to the caverns while Ruggedo, his Chief Magician, and his minions plan his strategy. They place the entrance to the Hollow Tube in their path and make it invisible. After continuing a long way, the adventurers found themselves sliding down a huge tube toward the other side of the world. Once there they meet a gardner named Tubekins and he commands they follow him to the castle. The adventurers enter the castle full of kings and queens. Someone explains to them that the castle is ruled by the Private Citizen (Tititihoochoo). Realizing that Ruggedo was the one to blame, the Citizen agrees to punish Ruggedo and treat the adventurers as their guests for the evening. After leaving the castle, Betsy and the rainbow fairy went to the palace of Queen Erma, Queen of Light. There, Betsy got a good night’s sleep. The next morning, The Citizen sends the adventurers on their way along with the Instrument of Vengeance (which will take away Ruggedo’s powers and make him a homeless wanderer on earth). He selected Quox, a young dragon, as the Instrument. The adventurers, now riding Quox, began their long journey yet again. Ruggedo and the Royal Chamberlain look through the magic spyglass and see the adventurers and the dragon coming up the tube. The Nome King and his Chamberlain set out for the tube to attack when the adventurers when the emerge from the tube. The Nome soldiers, led by General Guph, attempted to capture the adventurers. The dragon, howerver, carried the adventurers higher than the nomes could reach. Queen Ann ordered Tik-Tok to attack the soldiers, but they ran back to the caverns. Queen Ann and her officers fall into a pit in the cavern. Tik-Tok tries to conquer Ruggedo and Betsy is locked in the Chamberlain’s room. Hank attacks Ruggedo and knocks him against a wall. Meanwhile, Files, Shaggy, Ploychrome, and the Rose Princess wait outside. Shaggy and the others decide to attack. Shaggy, Files, and Ozga are instantly captured. Polychrome tries to wake up the sleeping Quox. Ann and her officers find a passage out of the pit. Shaggy Man is transformed into a dove and Ozga is transformed into a fiddle. After successfully waking Quox, Polychrome and Quox decide to attack. Quox is instantly captured. However, upon seeing the dragon’s ribboned locket, Ruggedo’s magical powers vanish. Quox opens the locket and eggs appear and frighten Ruggedo—chasing him away from his kingdom. Shaggy and Ozga are restored to their normal forms. Kaliko, the Chamberlain, leads Betsy to her friends. Quox names Kaliko the new Metal Monarch and Shaggy asks him to release his brother. Kaliko explains to the adventurers that Shaggy’s brother is in the Metal Forest. Quox says goodbye and leaves for the tube. Ruggedo, wandering aimlessly, remembers about the Metal Forest and the riches it holds. Overhearing his plan, Plychrome flies back to the adventurers and tells them the way to the Metal Forest. They continue to make their way to the Forest. When Betsy and her friends reach the Metal Forest, they discover Queen Ann and her officers capturing Ruggedo. Upon learning about the shift in power, they free the former King and allow him to fill his pockets with gems and leave. Shaggy Man is reunited with his brother, the Ugly One (who wears a mask to hide his ugliness). Betsy and her friends say goodbye to Kaliko and leave the forest, but before they leave they notice a trail of gems leading out and see Ruggedo at the end of the trail. He agrees to help Shaggy’s brother and tells them that a mortal maid must kiss him. Betsy agrees to help. The charm isn’t broken. The Rose Princess (who was once a fairy) tries and fails. Polychrome tries and breaks the spell. Kaliko agrees to let Ruggedo stay as long as he stays out of trouble. Betsy and her friends say good-bye to Polychrome. Ann expresses her homesickness and dismay for trying to conquer the world. Ozma and the Wizard sit watching the entire spectacle in their magic picture frame and feel sorry for Queen Ann. The Wizard instantly sends Queen Ann, her officers, Files and the Rose Princess back to Oogaboo. Tik-Tok is sent back to Oz. Ozma consults with Dorothy about the strangers. The Wizard sends for Betsy, Hank, Shaggy and his brother. Hank appears in a stable in the Emerald City next to the Cowardly Lion, the Hungry Tiger, and the Sawhorse. Toto speaks for the first time. Ozma welcomes the new friends to the land of Oz. Baum, L. Frank. Tik-Tok of Oz. Lit2Go Edition. 1914. Web. <https://etc.usf.edu/lit2go/23/tik-tok-of-oz/>. April 19, 2019. L. Frank Baum, Tik-Tok of Oz, Li2Go edition, (1914), accessed April 19, 2019, https://etc.usf.edu/lit2go/23/tik-tok-of-oz/.